Taronga Zoo is full of many wonders. Most of them I can name on sight. It's not that hard to identify an elephant, for example. Or a gorilla. Or even a tiger, despite it having its back towards you as it rests in the heat of the day. "No, I am not a sloth. I am just very, very warm." If you know, and you're the first person to post & get it right, I will write a blog post dedicated to you. It's not much of an offer, sure, but hey, I don't have any Girl Clumsy-themed pencils I can hand out. It wasn't the only animal checking me out - look! 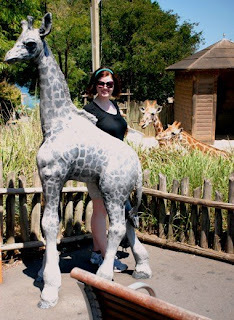 Giraffes!!! "Umm... should we tell her that one's not real?" Next, a Battle of the Titans - Kodiak bear V Lizard! "I will crush you, bear. 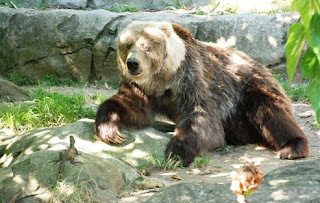 It will be a 'Kodiak' moment." And finally, some CHEESE-EATING SURRENDER MONKEYS! That's our good friend Casey, a Briz Vegas deserter, who's livin' la vida loca Sydney-side now as he project manages his way through a series of IT ...projects. He had yet to tick Taronga Zoo off his "list of touristy things to do", so we were very happy he decided to come along. 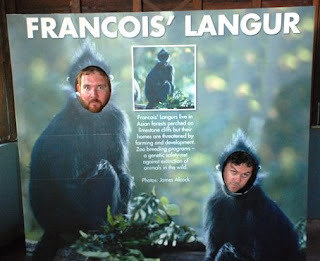 We spent the day behaving inappropriately, including taking the above photo and bagging The French. Sorry about that, The French. Now do an article about BubbleWrap!! This doesn't take away from my excitement at winning though. An Aussie Male Raccoon...always getting the wife to do everything for him! I'm just disappointed no sloths made an appearance. Only a non-sloth. ...the really sad bit is that I recognized it as a Binturong. And then I moused over the pic. Couldn't have been a sloth, though. Wrong posture. DAMNED FILE NAMES. I AM A CERTIFIABLE NUMBSKULL. That was a fabulous idea, ruined once again by my infernal lack of basic computer knowledge. Wow. You are all very clever! It never even occured to me to check the filename. 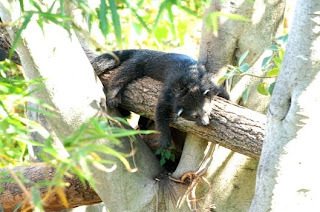 All I could think of was how utterly comfortable he or she looked lounging on that tree, and I was a tad jealous. Great post, Nat! This makes me want to go to the zoo. Last time I went to the zoo it was just as two gigantic turtles decided to mate. It was the most horrifying moment in slow motion I'd ever seen. Sadly, I have pictures of it. Somewhere. It was too disturbing to not document. "If you know, and you're the first person to post & get it right,"
Your competition, interpret the rules as you see fit. I would have guessed an Aye-Aye or some other type of lemur related creature. 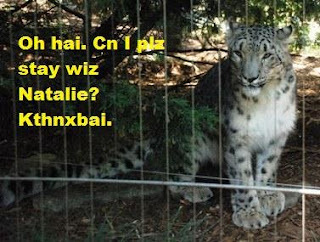 Poor snow leopard, he/she must be SO hot. Maybe you should rescue Trixie and move somewhere much colder Nat. 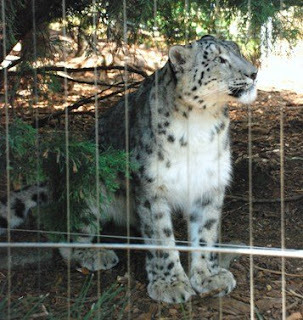 that snow leopard is soooo cute, little puddy cat with big paws..awwww.